Visible Ink Press : Who urged President Roosevelt to pursue the atom bomb? Who urged President Roosevelt to pursue the atom bomb? He was a German-born scientist. He believed Germany was in production of an atom bomb. He was offered the position of President of Israel. Albert Einstein, who was born in Germany in 1879 and was educated in Switzerland (where he also became a naturalized citizen), was an ardent pacifist. But, being a brilliant observer, he quickly perceived the threat posed by Nazi Germany. Einstein was visiting England in 1933 when the Nazis confiscated his property in Berlin and deprived him of his German citizenship. Some might call it lucky that the Nobel prize-winning (1921) scientist was out of the country when this happened--in the coming years, other Jews certainly suffered worse fates as Nazi Germany, under despotic ruler Adolf Hitler (1889-1945), persecuted and killed more than 6 million Jews. Einstein moved to the United States, where he took a position at the Institute for Advanced Study in Princeton, New Jersey. There he settled and later became an American citizen (1940). 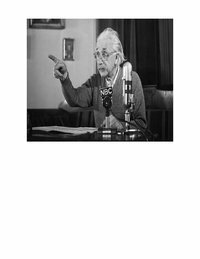 In August 1939, just before Adolf Hitler's German troops invaded Poland and began World War II (1939-45), Einstein wrote a letter to President Franklin D. Roosevelt (1882-1945), urging him to launch a government program to study nuclear energy. He further advocated the United States build an atomic bomb, cautioning that such an effort might already be underway in Germany. The United States did in fact begin development of the atomic bomb, which releases nuclear energy by splitting heavy atomic particles. The program was called the Manhattan Project, and it was centered at Oak Ridge, Tennessee, and Hanford, Washington, where scientists worked to obtain sufficient amounts of plutonium and uranium to make the bombs. The bombs themselves were developed in a laboratory in Los Alamos, New Mexico. The project was funded by the government to the tune of $2 billion. The first atomic device (made of plutonium) was tested in Alamogordo, New Mexico, on July 16, 1945. And less than a month later the United States dropped atomic bombs on Hiroshima (August 6) and Nagasaki (August 9), Japan, forcing the Japanese to surrender. After the war, Einstein, who was always interested in world and human affairs and had regretted the death and destruction in Japan, advocated a system of world law that he believed could prevent war in the atomic (or nuclear) age. A Zionist Jew, in 1952 he was offered the presidency of the relatively new state of Israel (founded 1947), but he declined the honor. He died in New Jersey in 1955.